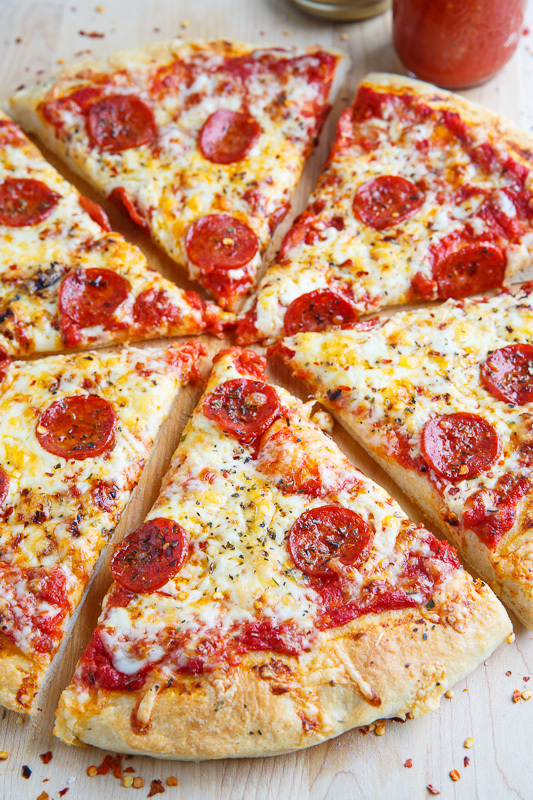 A super easy and tasty homemade pizza dough that is perfect for pizza night! 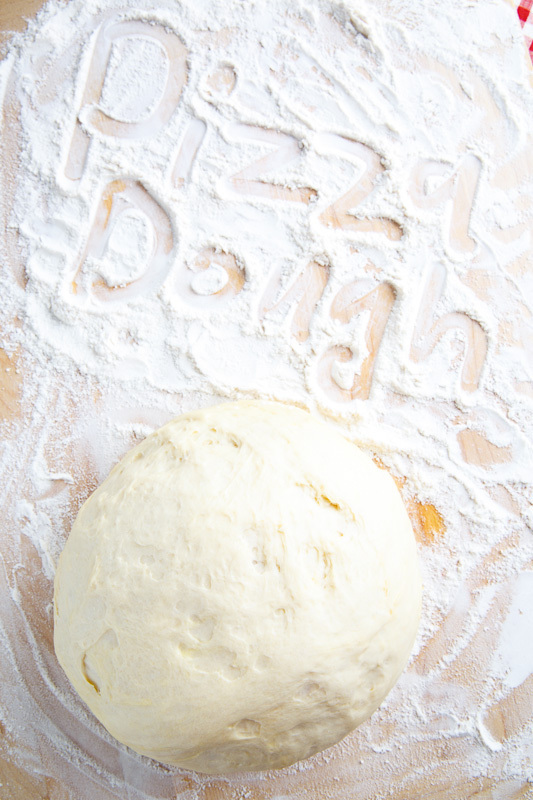 Pizza night has never been easier or better than with this super easy homemade pizza dough! You pretty much just mix the few simple ingredients, knead it for a few minutes, let it rise, spread it out and you are good to top it with your favourite pizza toppings before baking it to pizza perfection! Since it does require some rise time you need to plan ahead a bit but you can also let it rise in the fridge for 24 hours so it’s ready to go when you are! 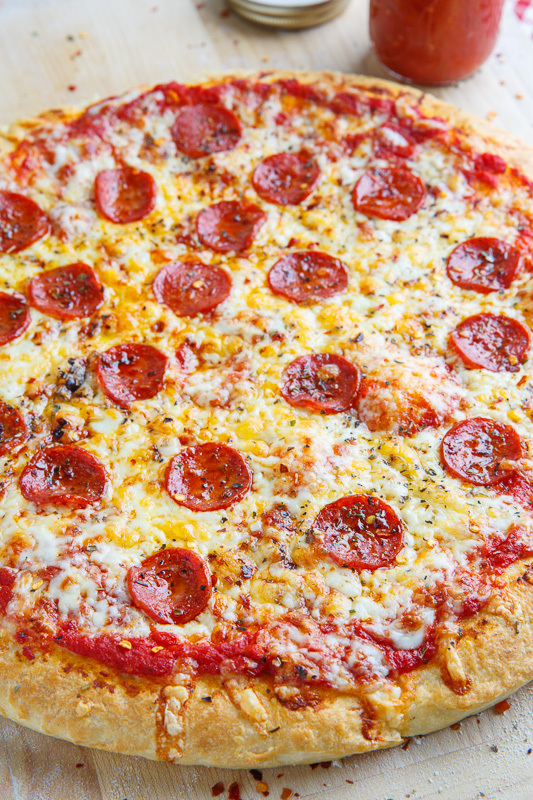 Once you have the dough all loaded up with toppings it only takes 10-15 minutes in the oven to bake, making for one really quick and easy pizza dinner! 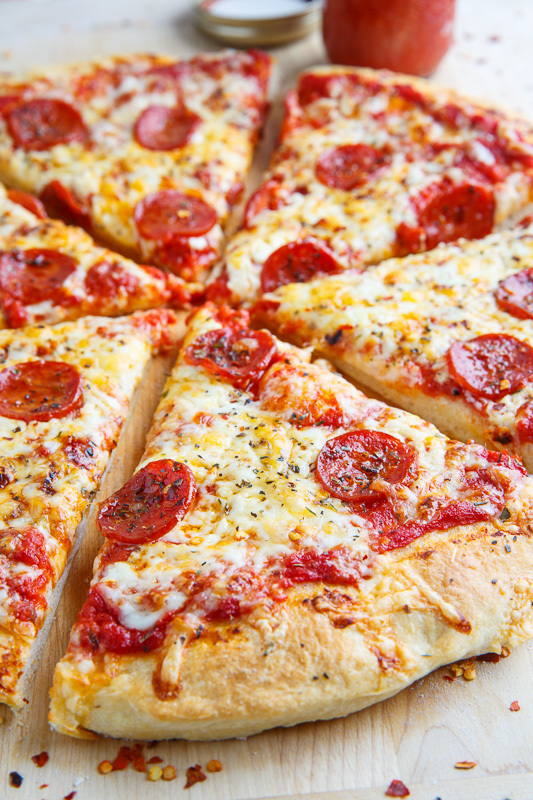 Throw some pizza sauce, mozzarella and pepperoni on and you’re good to go! Mix the water, honey and yeast and let sit until foamy, about 10 minutes, before mixing in the oil, flour and salt until it forms a ball. Knead the dough on a floured surface until it is smooth and elastic, adding enough flour to prevent it from sticking, about 5 minutes. Oil a large bowl, place the dough in it, cover it and let it rise to doubles in size, about 1 1/2 to 2 hours. Form or roll the dough into the desired shape, place on an oiled baking sheet, top with your favourite toppings and bake in a preheated 500F/260C oven until the edges of the dough are golden grown, about 10-15 minutes. Tip: Sprinkle some cornmeal onto the oiled baking sheet to help prevent sticking. Option: After kneading the dough, place it in the covered oiled container and let it rise in the fridge for 24 hours before pulling it out 10 minutes before using it to let it warm up. Option: Brush the edges of the dough with garlic butter for a tasty crust! I’m so happy to hear that you liked this pizza dough, despite it being difficult to work with! i always appreciate when people post their kitchen frustrations – so i know i’m not the only one who has them! pizza dough is an enigma with me – sometimes i get it right, sometimes not. i think it is one of those things i will quest the rest of my life to perfect. not that i’m sad about that 😉 i’ll try this one, though, since you seem to have eventually succeeded 🙂 and, personally, i like the odd shaped pizzas. they remind me so much more of the pizza i gorged on every day in italy. mmmm. Can you please specify what is 'Bread Flour'? Anshu: Bread flour has a slightly higher protein content than all purpose flour (12-14% vs 10-12%) which makes it better for bread products such as this pizza dough. how many ounces of flour is it for 4 1/2 cups bread flour? Ellen: 4 1/2 cups bread flour is about 20 ounces. Kevin? I see this recipe makes three pizza doughs… can the remaining 2 be frozen then thawed out for later use? lostsoulhelpmejebus: Yes you can freeze the other two for later. Just let them thaw in the fridge overnight and continue as normal. I've tried dozens of recipes for pizza crust, nearly all only once. This one I'll be trying again …..I agree with you Kevin, It's difficult to work with and STICKY I had cornmeal and flower all over the kitchen before it was done. I did manage a roundISH pie on the third one… BUT by far the best by far for a nice thin crust. Great texture and taste…. Thanks for posting! I'm more interested in what 2 cups of bread flour weighs as opposed to what 4 /12 cups weighs. Is there an error here? I love an easy pizza dough recipe! Wondering how well it will work in a bread machine. 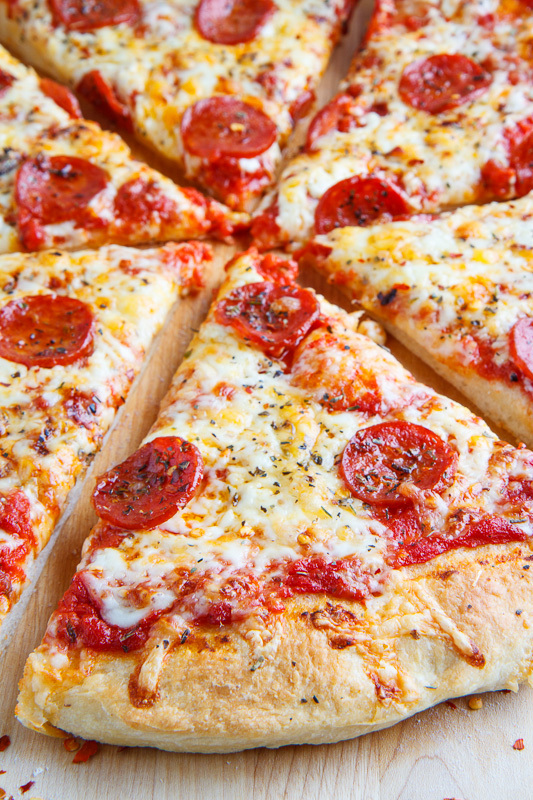 pizza That sounds really easy and simple! I love to cook and bake but so afraid of pizza dough. After reading how easy and yummy this sounds, I’m determined to try it. What have I got to lose? Your pictures are so gorgeous. Thank you. This is a basic pizza dough. It has a nice crispy crust and a soft inside. If you place cornmeal under the dough it helps to prevent it from sticking to the baking dish. Mix the yeast and warm water in a bowl and let sit for 10 minutes. Add everything else and mix until it forms a dough. Cover and let sit until it doubles in size, about 30 minutes. On a well floured surface form the dough into a flat circle. Transfer the dough to a baking pan with cornmeal spread over it. Top with toppings and bake in a preheated 350F/180C oven until golden brown, about 20 minutes. I still have yet to try making my own dough… someday! hi kevin! Im browsing your recipe and it all looks yummy! I will try one of it one day. Maybe i will try first the Basic Pizza Dough. what flour you used for this? vensi: I used all purpose flour. for alternative textures and flavors, try using cake flour, or a combination of all purpose and semolina flour. I love your site, by the way. you’ve completely inspired me to cook more and the recipes on your site that i’ve tried have all been fantastic! I make my own pizza dough all the time, but use 3/4 cups of water to 2 cups flour instead. I also use ABin5 (no knead) olive oil dough which is good for pizza and ciabatta rolls.